Damir Šodan (1964, Split) is a poet, playwright, editor and translator who graduated from Zagreb University with a BA in English Literature and History. He has published four volumes of poetry: Sound Changes (1996), The Middle World (2001), Letters to a Wild Scythian, (2009) and Café Apollinaire (2013), two collections of plays: Safe Area (2002), The Night of the Long Beams (2009) and an anthology of contemporary Croatian "neorealist" poetry: Walk on the Other Side (2010). 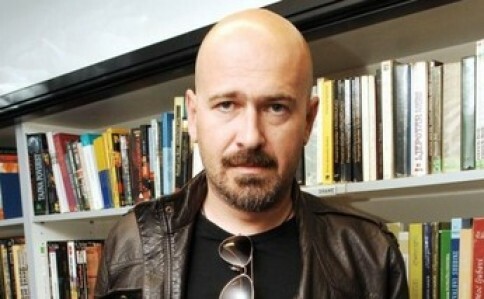 He was awarded the Držić prize for the burlesque Chick Lit (2012) and the 1st prize at the playwriting competition for ex-Yugoslav writers in Vienna (2000) for the dark comedy Safe Area. Internationally, his work has been among other featured in The American Poetry Review (2007), New European Poets, (Graywolf Press, USA, 2008), Les Poètes de la Méditerranée (Gallimard, 2010), The World Record and A Hundred Years' War (Bloodaxe, 2012 and 2014). He translated Raymond Carver, Leonard Cohen, Charles Bukowski, Charles Simic, Richard Brautigan and Frank O'Hara into Croatian. He is an associate editor of Poezija and Quorum magazines in Zagreb. "have you ever had a lap-dance?" viewed devotedly all across Europe. "Madiba, you don't have to answer that!" as many as fifty-two letters a year! "you don't have to answer, Madiba"! with the expected civility and finesse. "have you ever been on the Moon, Jeremy"? heart of black Africa - in the right place. all the way to the town to see a football game. of the Altai region in the far east. suddenly scowls his fissured face. purpose in the devil's name he needs them for. burn a deep hole in their souls. will be an uncertain and long one. more or less someday fall into place. perhaps I'm myself still only - slowly but surely - just getting there. - alongside The Beatles - as the greatest r'n'r band of all time. before she turns her back on us for good. behind the cast iron fence. of some relative future tense. you saw the most beautiful girl. Tommy Ramone died in 2014. Leopoldo María Panero (1948-2014), arguably one of the finest contemporary Spanish poets, a victim of Franco's regime, who lived and died in a psychiatric asylum in Las Palmas, Canary Islands. Vincente Huidobro (1893-1948) Chilean poet known for promoting avant-garde literary movements in Chile, creator and the greatest exponent of the literary movement called Creacionismo.